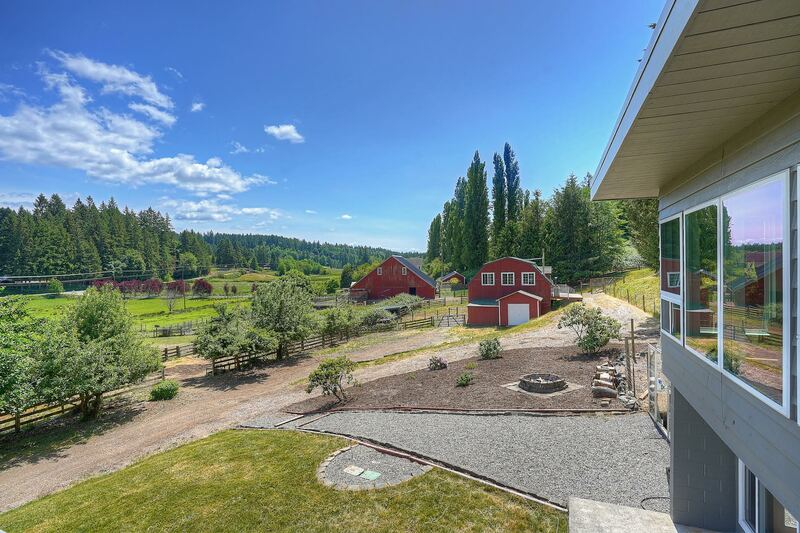 A dynamic blend of country living and city convenience await with this rare 10.8-acre farm in Gig Harbor! Nestled in the idyllic Ray Nash Valley, this rare opportunity doesn’t come around often. Featuring a 3,640-square-foot updated mid-century modern home, a 3-stall barn with a 1,000-square-foot room upstairs, fenced pastures and so much more, this incredible estate offers the lifestyle you’ve always dreamed of. 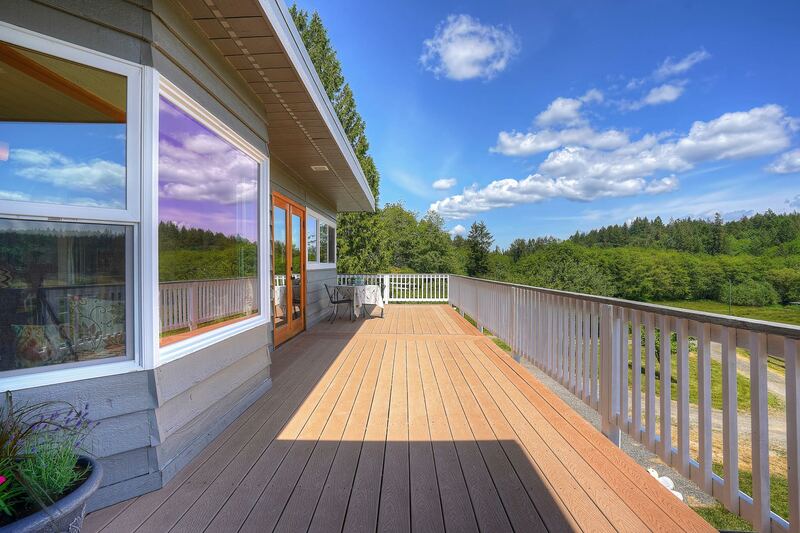 Located at 5816 Ray Nash Dr NW Gig Harbor WA 98335 and no more than 10 minutes from both Downtown and Uptown Gig Harbor, this outdoor oasis is listed for $875,000. An extra-long driveway leads past a creek and sprawling pastures to this property’s home-sweet-home, a beautifully updated 1970-built mid-century modern home that’s ready for the future. 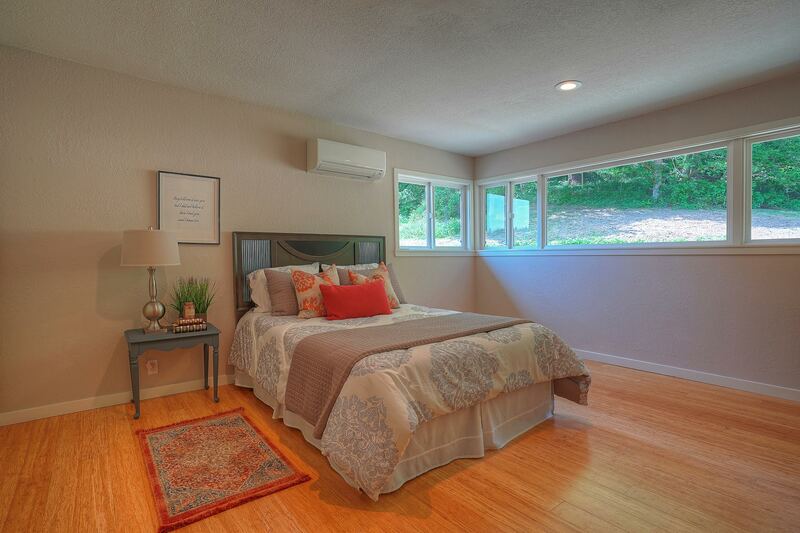 Solar panels are among this home’s updates, and once you step in through the front door, this residence’s well-appointed interior welcomes you in. Walls of windows fill the space with natural sunlight, while offering views of the picturesque scene that stretches on into the distance. 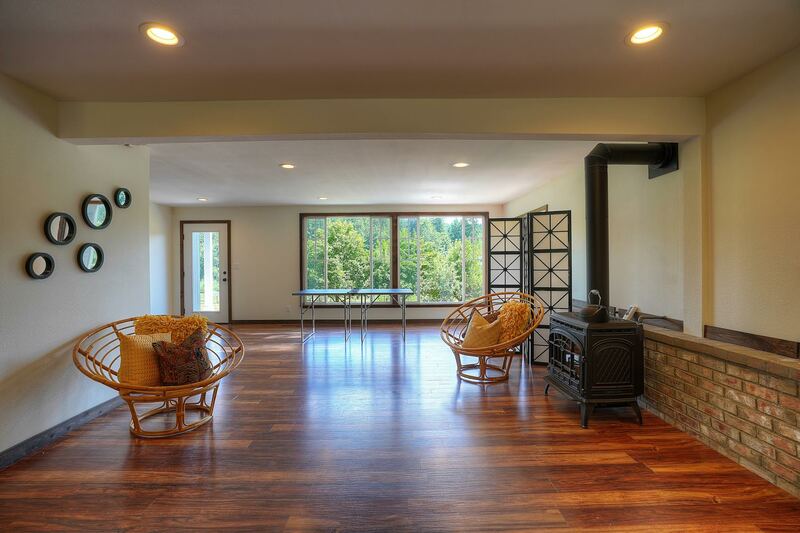 Imagine entertaining guests or relaxing in the spacious living room with the natural Pacific Northwest scene unfolding in the background! The layout flows into the dining room and the adjacent kitchen, an absolute delight for those who love to entertain. Whether you’re serving up formal dinners in the dining room, hosting barbecues on the deck, or just enjoying a laid-back snack at the kitchen island, you’ll find a place for it all. The epicurean kitchen is especially noteworthy, with its gorgeous lyptus cabinets, quartz counters, Wolf steam convection oven, bamboo floors, and rich wood elements all wrapped up into one incredible package. When it’s time to unwind, this home’s 4 bedrooms promise privacy and comfort, and especially of note is the master suite. Showcasing a spacious and bright atmosphere with handsome floors, this haven includes 3 closets and a spa-inspired master math. A double vanity with double medicine cabinets and a tile-accented shower make for a rejuvenating experience. Find a similar atmosphere in the additional bedrooms that also offer flexibility in use, and discover ample potential in this home’s lower level living areas. 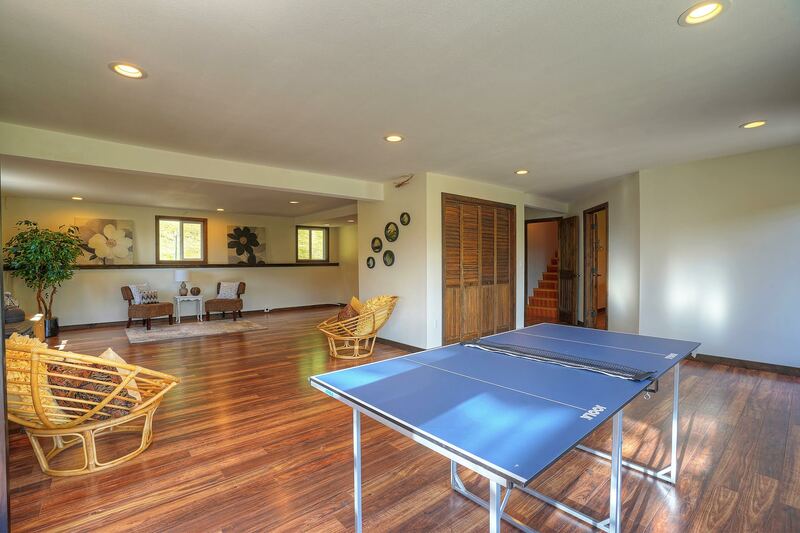 Whether you desire the ultimate hangout space, a guest suite, a recreation area, a hobby room, office, fitness center, or playroom, you’ll find space for all of this and more! The same can be said for this home’s storybook outdoor setting. In the classic red barn, not only will you find 3 stalls for animals, but a second story 1,000-square-foot room upstairs is also included. A greenhouse is in the mix as well, giving you the perfect spot to try out your green thumb, and a large garden area is ready for cultivating fruits, veggies, and flowers. 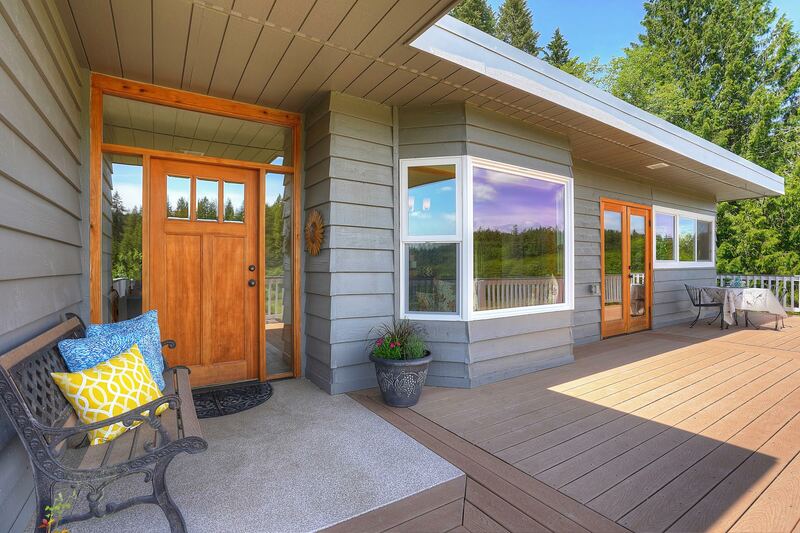 From livestock grazing in the tranquil pastures to the bucolic scene that sprawls into the distance, you can enjoy a view of it all from the expansive deck! 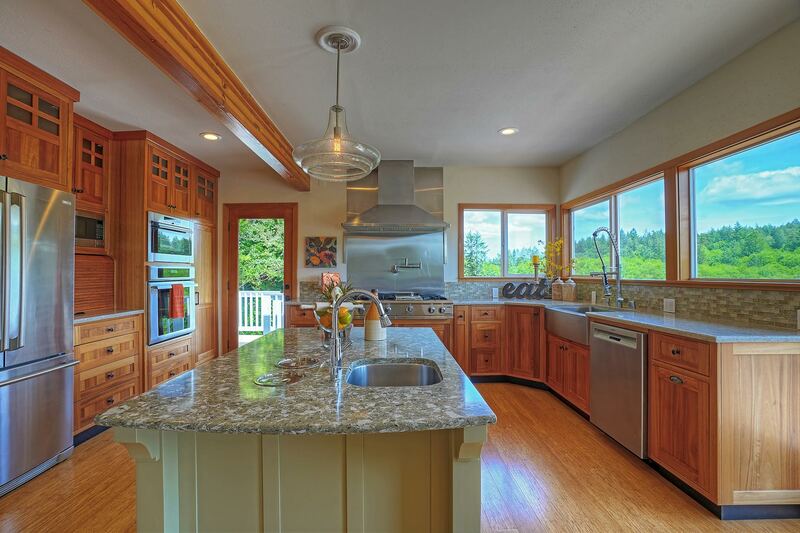 At 5816 Ray Nash Dr NW Gig Harbor WA 98335, you can enjoy the benefits of both country living and city conveniences! Schools, shopping, restaurants, parks, and more are all within reach. If you’re in the mood for outdoor exploration, Kopachuck State Park is only a 3-minute drive away, and the Gig Harbor Golf Club is a short 5-minute drive away. Highway 16 is only 10 minutes from home, and whether you want to head to Downtown Gig Harbor or Uptown Gig Harbor, you’ll find it all no more than 10 minutes from home as well!